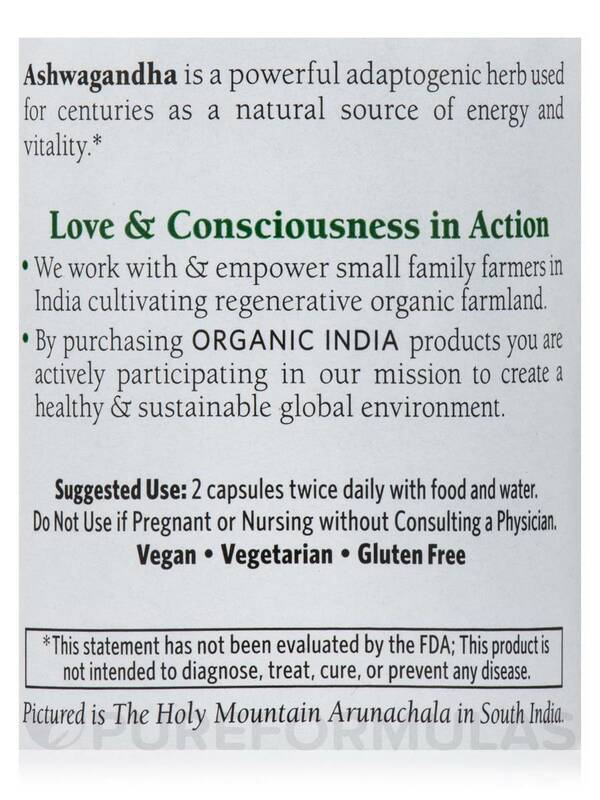 I have only been taking this Ashwagandha by Organic India for one week and I am already feeling a difference! 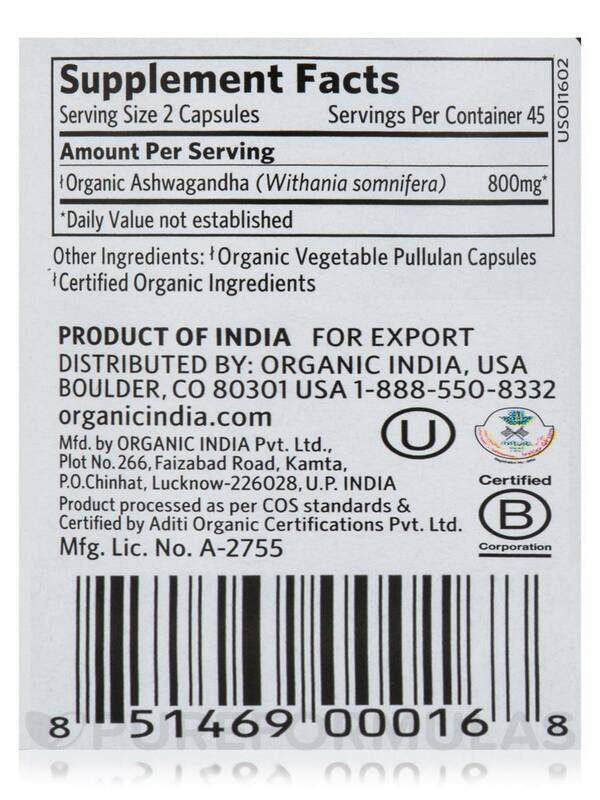 Some products are worth paying a little extra for, for me Ashwagandha by Organic India is one of them. Quality product and organic. I like PureFormulas it is a reputable company. Ashwagandna by Organic India is worth the extra money to know you are getting quality! Ashwagandha is highly valued in the Vedic tradition as a rasayana‚ or tonic‚ that promotes longevity and vitality. Ashwagandha is an Ayurvedic name that translates to “the rooted power of a horse‚” a reference to this herb’s revitalizing and strengthening properties. Ashwagandha is also known as “Indian Ginseng‚” as its actions parallel those of the Ginseng used in Chinese medicine. Ashwagandha churna‚ or powder‚ is traditionally combined with boiled milk and honey to provide a nourishing tonic. ORGANIC INDIA’s Ashwagandha is an excellent alternative to the now over-harvested ginseng‚ as it grows quickly and is cultivated using regenerative farming practices that heal our Earth. 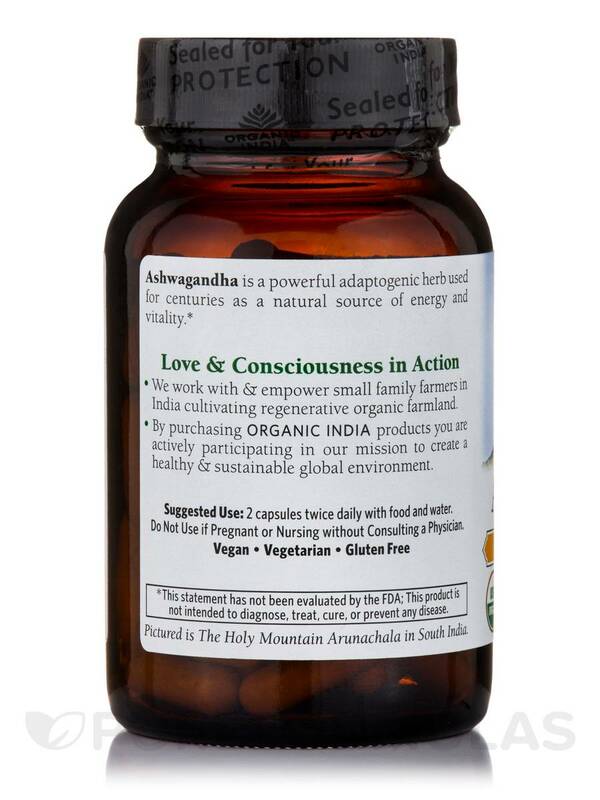 I ordered Ashwagandha by Organic India to help with adrenal fatigue and sleep issues. It works for me. I take 1 at night before bed and I seem to sleep much better. I wake up feeling more rested. It actually works for me. I like that it's organic, they don't use fillers and I haven't experienced any side effects. Organic India grows and sells top quality Ashwaganda. Pure Formulas sells the capsules at a great price. Using 4 capsules a day for 3 months has DRAMATICALLY improved my chronic stress issues, which we all know lead to an increase in "belly fat" due to problematic cortisol levels. Ashwaganda really does work extremely well to modulate cortisol level issues that lead to "belly fat" accumulation due to chronic stress. I did a huge amount of research on Organic India and how they grow and bring their Ashwaganda to market. They are FIRST CLASS. Thank you to Pure Formulas for keeping these herbs in stock. Would like to be able to buy bottles with more than 90 capsules in them! Taking Ashwagandha by Organic India has been fine so far. I believe it's to early to really give a good estimate of the results. I really like Organic India's Aswaganda! I've been going through a really stressful time and since I started taking it I haven't been sick once! Because I have Lyme I suffer with adreanal fatigue. 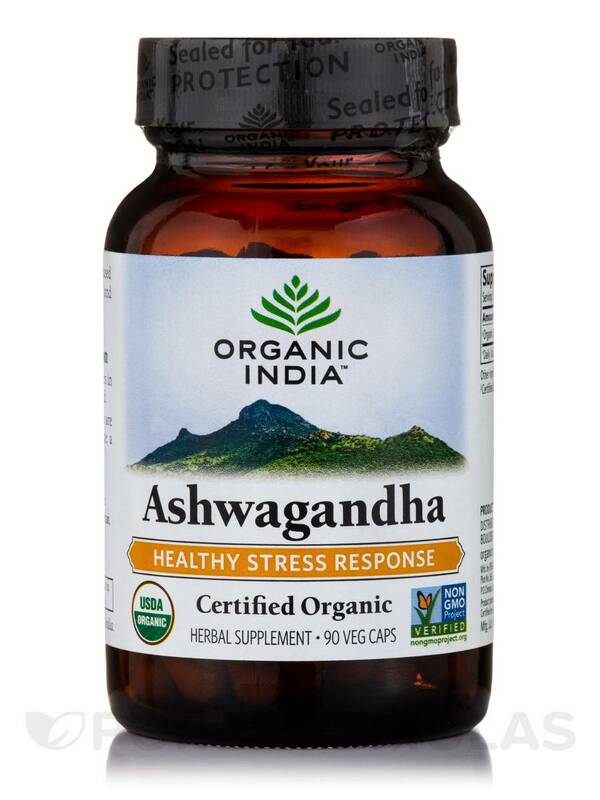 Ashawaganda by Organic India is helping me with the stress and exhaustion issues. Organic India produces only the best. 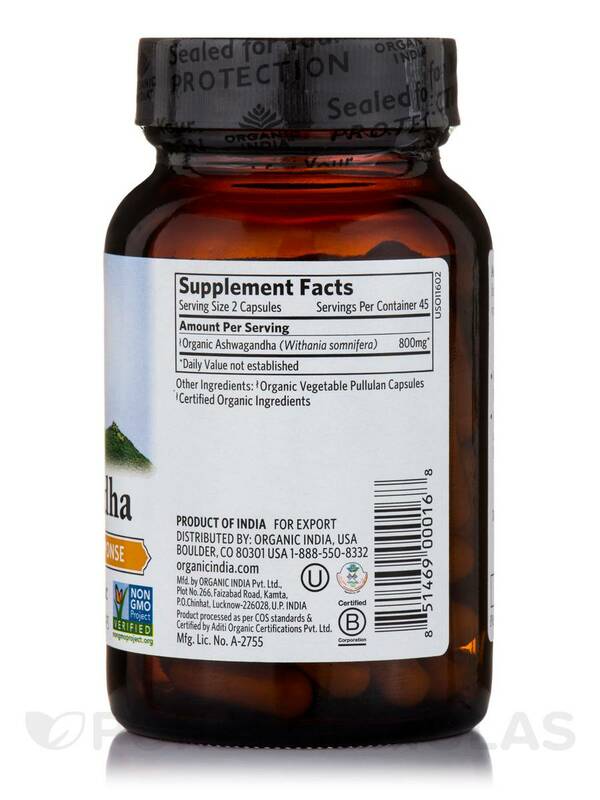 My chiropractor recommended me taking Ashwagandha by Organic India because I've slept horrible for many years and I don't want to take synthetic drugs that mess with your brain. I've been taking 1 in the AM and 2 in the evening for a couple month's now. I do feel less anxious, and although sleeping better, I have a sciatica issue which impacts my sleeping. I think once I've resolved that issue, I will be able to say I am sleeping much better. The interesting result of taking this so far is I've stopped biting my nails. I've been a nail bitter for the past 50 years of my 54 years. I have tried many times to stop and I've tried every nail bitting deterrent known to man. It's been 3 weeks of no biting and my nails are looking really good. I don't have to hide my hands anymore. It's almost impossible to stop once you reach my age, since it's imbedded into you to pacify stress and anxiety. Nothing has changed outside of taking this supplement. Although I have a lot of stress in my life I do feel less anxious. Since I am taking 3 a day it does add up since this isn't the only supplement I take. Ashwagandha by Organic India has really helped me with stress, sleep and headaches(which are caused by inflammation) and it has no fillers . I get the results I was hoping to receive from Ashwagandha by Organic India. It does what it advertise.